Tonight, on the Outdoor Channel, you can watch four of America’s best female action and multi-gun shooters. In tonight’s episode of the Shooting Gallery on the Outdoor Channel, ace USPSA shooters Julie Golob, Tasha Hanish, Lisa Munson, and Randi Rogers show off their skills with pistols, rifles, and shotguns. Golob, captain of Team Smith & Wesson, is a National Champion Pistol Shooter who is now taking up the multi-gun challenge. Hanish, one of the top shooters for Team FNH, is a two-time USPSA Multi-Gun National Champion (Women’s Tactical Division). Lisa Munson has captured 11 National Pistol titles over the years, and now competes with Team Smith & Wesson, along with Golob. Randi Rogers (aka ‘Holy Terror’) is a multi-time Cowboy Action Ladies World Champion who has been shooting modern pistols with Team Glock for the past few years. Randi has won numerous tournaments for Glock. If you ever get a chance to watch Randi shoot a lever gun (from her cowboy action days) — you will be amazed. In speed events, using her lever gun, she could beat most male competitors who are using modern semi-auto rifles. She is that fast and accurate. Here is a preview from Tonight’s Shooting Gallery, hosted by Michael Bane. Outdoor Channel Airtimes are: 03-16-11 at 3:30pm, 7:00pm, 9:00pm | 03-17-11 at 3:00am. Tasha Hanish at Multi-Gun Nationals — You Go, Girl! 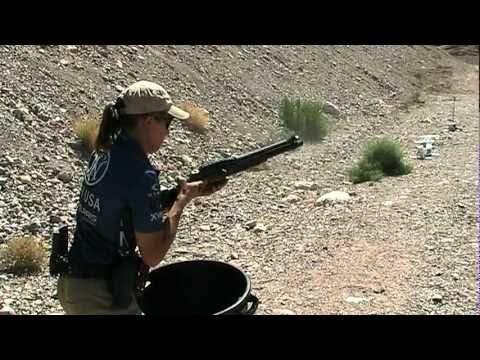 In the following video, taken at the 2010 USPSA Multi-Gun Nationals, you can see Tasha Hanish blaze through a 3-gun stage. Tasha starts with her 9mm pistol, then grabs her shotgun to blast steel plates, and finally engages a bank of 200-yard targets with her FNH SCAR rifle. Tasha won the Ladies’ 2010 Multi-Gun Championship in the Tactical Class. Share the post "Superstar Lady Shooters Featured on Outdoor Channel Tonight"
Here’s the perfect part-time job for a web-savvy gun aficionado. Berreta is seeking a free-lance Social Media Manager to work with gun blogs, gun forums, Facebook, Twitter, MySpace and other social media outlets on the internet. Beretta’s Social Media Manager will be tasked with promoting Beretta’s products and direct-marketing initiatives through non-traditional digital media. What does that mean? Well, you’ll send press releases to sites like this one, you’ll update Beretta’s facebook page regularly, and you’ll monitor gun forums to “spread the word” about Beretta firearms and sporting products. ESSENTIAL JOB FUNCTIONS: Work with Marketing team to take existing collateral and promote it on all applicable social networking touch points. Ensure social media tools are kept up to date. Manage social media campaigns and daily activities to include: on-line advocacy, writing editorial, consumer-outreach efforts and promotions. Be an advocate of Beretta in social media spaces, engaging in dialogue and answering questions. Manage presence in social networking sites including Facebook, Twitter, and other similar community sites, posting on relevant blogs, and seeding content where applicable. Monitor trends in social media tools. • Bachelor’s degree in Business Administration, Marketing, or related field, or combination of education and related work experience. • Minimum of 5 years experience representing a recognized brand. • Knowledge of Beretta products and services required. • Advanced pc skills including Microsoft Office/Internet. • Ability to troubleshoot pc-related technical problems. • Strong command of the English language. • Attention to detail and accuracy required. Share the post "Earn Bucks Blogging for Beretta as “Social Media Manager”"